Autumn brings colder weather, fall sports, and colorful foliage on the trees. The changing season also brings new chores and outdoor work, along with the potential for injuries while accomplishing these tasks. Leaf raking is one such task, with injuries ranging from strained back muscles to twisted knees. The following tips can help make leaf raking a breeze this autumn. Stretching or warming up before you begin is an important step helping prevent back pain when raking leaves. Take 10 minutes to stretch properly and warm up your muscles. Areas of the body to focus on when stretching include the neck, back, hips, torso, wrists, and shoulders. Getting your heart rate elevated slightly will also help as you prepare to rake. Using proper form when raking leaves can significantly reduce the chance of injuries. “Hold the rake handle close to your body and keep one hand near the top of the rake for better leverage,” explains Michael. Stand with legs slightly bent and weight distributed evenly. Be sure to place the forward foot in position first, then follow with the hips and the rest of the body to ensure proper posture. Try to maintain an upright posture and avoid twisting. Switch hands every few minutes to prevent overuse on one side of the body. Improperly lifting heavy bags of wet leaves is one of the most common ways to sustain an injury while raking. Using proper lifting techniques lessens your chance of getting hurt. Don’t pile too many leaves into one bag – especially if they are wet. If possible, rake leaves onto a tarp and have another person help move the tarp. If you must stoop to pick up leaves, face the pile and do not twist as you lift. Just make sure to keep the load light and be careful to use good body mechanics when lifting the tarp. Many people do not realize it, but it is possible to injure yourself by using a rake that is the wrong size. A rake that is too long or too short will place unnecessary strain on the back, arms, and torso. 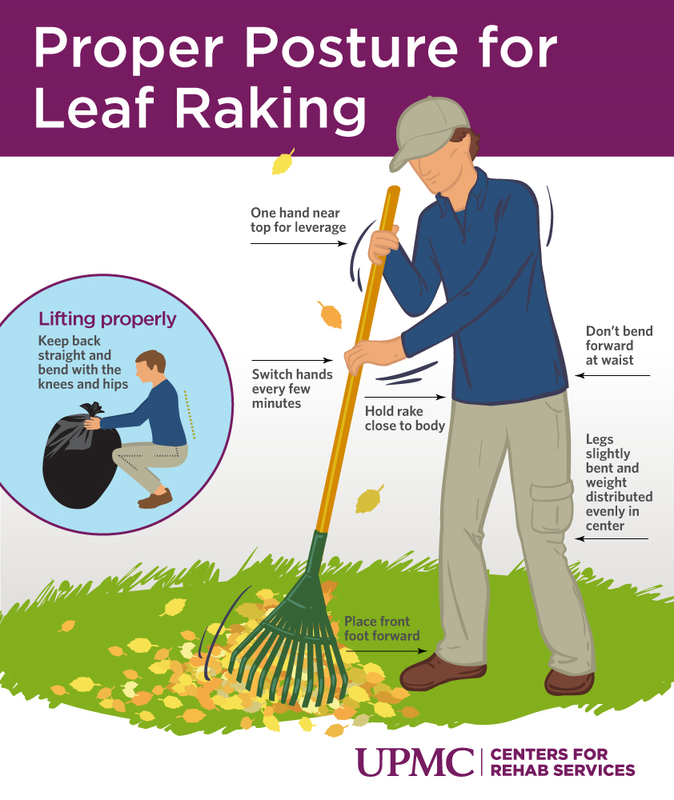 Using a rake that is larger than normal may seem like an easy way to gather more leaves, but it can cause unnecessary straining and reaching. The rake should be a comfortable length when moving up and down. Using a lightweight, ergonomic rake can ensure that your elbows are slightly bent and help you maintain good posture while raking. “Rakes that have padded or adjustable handles can reduce stress on your hands and back,” adds Michael. The clothing worn for leaf raking might not seem like it matters but it plays a large role in preventing injuries. Gardening gloves with non-stick palms can help prevent blisters and save hands from jagged twigs and thorns. Wearing loose, breathable layers helps maintain body temperature. And remember to use sunscreen. Some people want to power through and get the raking done as quickly as possible. Taking short breaks to catch your breath, drink some water, stretch your muscles again, and admire your progress is more beneficial. Tackling the entire yard at one time can seem like an overwhelming and daunting task. Dividing up the yard into sections and committing to a section or two at a time can make things more manageable. Sudden, sharp pain, or dull, incessant aching pain while raking leaves should never be ignored. Stop working if pain persists. Listening to the signals your body is sending helps you understand when to stop before injuries occur. Reward a hard day’s work with a warm bath or shower to soothe achy muscles, and gentle stretching to cool down. If pain persists, especially after proper precautions and healing methods have been exhausted, talk to your doctor. Why the Shoes You Wear Can Affect Knee Osteoarthritis Why does the top of my foot hurt?